Within 250 miles of El Dorado, AR. 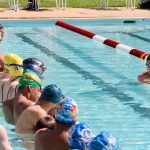 There are 2 ways to swim faster: reduce DRAG and increase POWER! This clinic works on reducing drag so that you can go faster with LESS energy! Learn how to reduce your drag and conquer the DRAGon in your swimming with Olympic silver medalist Connor Jaeger! Swimmers and parents are invited to ask Connor questions during a Q&A session. Gain insight into his training regimen, diet and nutrition, and recovery tactics. Get to know him and relate to his journey as inspiration for yourself. Observe Connor Jaeger swim at full speed and demonstrate a progression of perfectly executed drills to achieve powerful, efficient and fast swimming. Visual learners will greatly benefit from not only seeing drills and exercises done correctly, but also from seeing them live and in person! 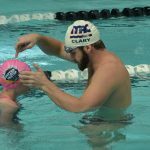 Learn the same drills that Connor practices every day as well as what he thinks about when he swims. Then get the chance to practice them and get feedback! Take a photo while wearing Connor's medals, get autographs, and recieve a special gift from our sponsors!